This is one of the more curious shows of the series. Frisell combines his Scherr/Wollesen trio with Scheinman/Kang/Roberts 858 group, for a 76-minute set drawing mostly from Unspeakableâ€”though only three of the album's 14 songs are represented; the rest combines of group improvisation, a lengthy version of "You are My Sunshine" that references classical composers Gavin Bryars and Aaron Copland. Form meets freedom, as the familiar theme and changes lead to a middle section where Kang, in particular, demonstrates a combination of respect and healthy irreverence that explains why he's been a constant companion for Frisell, dating back to Quartet (Nonesuch, 1996) and right through to today for the guitarist's most recent release, Beautiful Dreamers (Savoy Jazz, 2010). The presence of a conventional rhythm section means that this version of "What's Going On" grooves more decidedly, but not until Frisell has set the stage with a combination of ethereal, loop-driven atmospherics and long string trio tones. 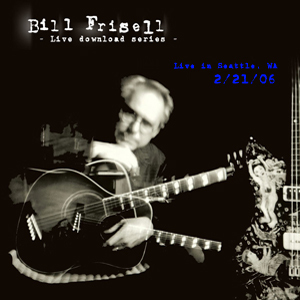 Some of Frisell's inherent appeal rests on the skewed edge he brings to everything he approaches; he's a rare guitarist who can take a standard chord, and turn it on its side by moving but a single note up or down a semitone. Jagged and noisy, the intro to Unspeakable's opener, "1968," combines angular harmonics, scraped strings and an apparent chaos of cross-rhythmic complexityâ€”apparent, because the group manages to magically coalesce a mere minute into this 20-minute version of an originally four-minute tune that's as propelled by Wollesen's Jim Keltner- like backbeat, as it is the group's collective interplay, pushing the song towards a thundering climax, and a seamless morph into a faster than usual version of The Intercontinentals' "Baba Drame."